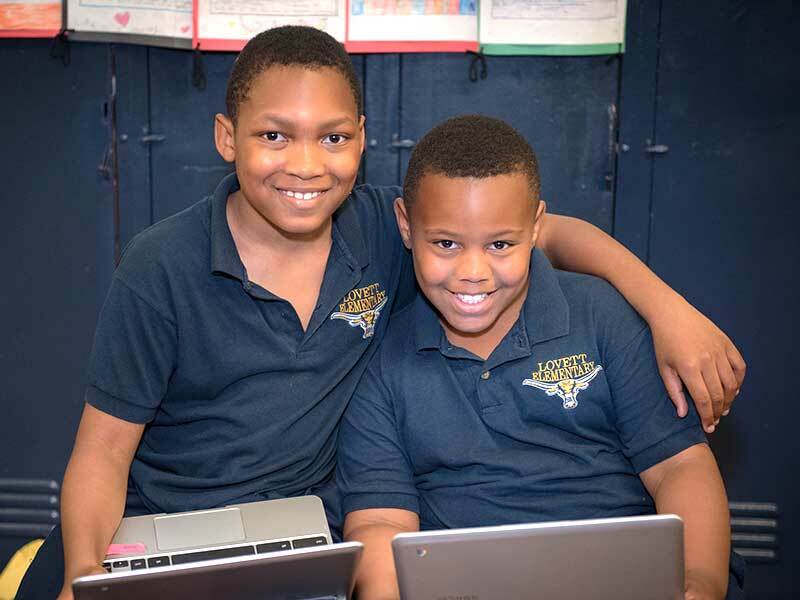 Lovett uses the Common Core State Standards as the foundation of its learning objectives, but modifies the objectives to make them more appropriate for their students’ learning levels. As the school year begins, many students aren’t ready for their grade-level Common Core standards. Teachers introduce the standard but also scaffold it, pulling in prerequisite skills to help students build toward the standard. In modifying the learning objectives, Lovett strikes the balance between covering the standards on which students are assessed, while also providing relevant learning objectives that students can understand. In class, students may be working on the same general topic (e.g. reading fluency), but the content will differ in depth and complexity based on the student’s skill level. For example, if the learning objective is the addition and subtraction of fractions, some students may be working on a more basic understanding of fractions while others have demonstrated mastery and progress on to multiplication and division of fractions. This structure allows students who are behind to work on the appropriate level of content, along with students that are progressing through standards more quickly. A key component of this approach is that students understand that they are all on the same learning pathway, just at different places along it.